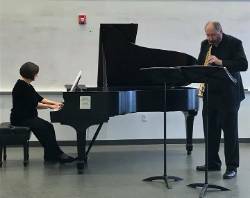 Dr. Brent Bristow, Professor of Music, and Mary Jo Parker, Assistant Professor of Music, recently performed at the 41st U.S. Navy International Saxophone Symposium. The conference was held on January 11-12, 2019, at George Mason University Center for the Arts in Fairfax, VA. Bristow and Parker performed two pieces for saxophone and piano, including a piece dedicated to them by composer Craig Wadley entitled Temporal Physics. This was Dr. Bristow’s 8th time performing at this annual conference event. The International Saxophone Symposium is hosted by the Navy Band and held each year in early January, featuring two full days of free performances, lectures, and various music education opportunities. College professors and musicians from around the world come together to share music and new ideas, including visitors from France and Spain. This year’s conference was well attended despite the first massive snowstorm of the season to hit the national capitol region.